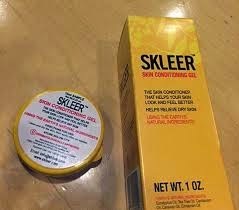 Skleer Skin Conditioning Gel is a product I now use multiple times a day. When I used most of my facial products I like to be in front of a bathroom mirror and able to wash afterwards. This is a product I don't mind carrying around with me and using on the go. It is a very cool and refreshing gel to put on. There are no added acids, alkali's or other damaging substances. It also does not have Benzoyl Peroxide or Salicylic Acid which are the most common ingredients in acne treatments, but the work it does on your face will make it your new favorite acne fighter. When using this you want to clean your face first, then use this product and after that use your makeups and moisturizers. Right now you can only buy Skleer from their website or from their phone ordering service. *There is a giveaway on this product. Either comment or contact me stating that you read this article and I will enter you in the drawing for free tube. Don't miss out!